An announcement bump for Mitt Romney and a bus-tour boost for Sarah Palin put the pair atop the field for the Republican presidential nomination. But while their primary standings are similar, their broader prospects for election look vastly different. Romney appears formidable: In a general-election trial heat in the latest ABC News/Washington Post poll he runs evenly with Barack Obama among all Americans, and numerically outpoints him, 49-46 percent, among registered voters -- not a statistically significant lead, given sampling error, but a clear reflection of Obama's vulnerability to a well-positioned challenger. Romney, though, is the only Republican to run that well; Obama leads all other potential opponents tested in this poll -- Palin, Newt Gingrich, Tim Pawlenty, Michele Bachmann and Jon Huntsman. Palin fares worst, trailing Obama by 17 points among all adults, 15 points among registered voters. Indeed, despite advancing in GOP primary preference, Palin faces daunting challenges. Sixty-four percent of Americans say they definitely will not vote for her for president, a new high. Sixty-three percent describe her as unqualified for the job, below its peak but still a substantial majority. Even in her own party, among Republicans and Republican-leaning independents, 41 percent rule out voting for her and 39 percent see her as unqualified. Overall, 21 percent of leaned Republicans support Romney for the nomination, 17 percent Palin, with all others in single digits. Still, while those two lead, the flipside is that each is not supported by eight in 10 potential GOP voters, indicating plenty of room to move as the field coalesces and voters tune in. Today just 22 percent of Americans (and 24 percent of leaned Republicans) are following the 2012 presidential election very closely. There is, moreover, a continued lack of enthusiasm for the Republican field. Fewer than half of Republicans and Republican-leaning independents, 47 percent, describe themselves as satisfied with their choice of candidates for the nomination, barely changed from 43 percent in April despite the official entrances of Romney, Gingrich and Pawlenty; exits of Mike Huckabee, Donald Trump and Mitch Daniels; and revving-up sounds from Palin, Bachmann and Huntsman. That's far lower than the level of satisfaction, 68 percent, in June '07. FRUSTRATED? -- The risks to Obama are underscored by the ABC News Frustration Index: It stands at 68, essentially what it was going into the 2010 midterm elections. Based on ratings of the economy, presidential approval, anti-incumbency and dissatisfaction with the federal government, it correlates strongly with House re-election rates and presidential prospects alike. The index peaked at 80 in 2008, when the Democrats regained the White House, and at 73 in summer 1992, shortly before the first President Bush lost re-election; it was 67 last fall, when the GOP regained the House and scored major inroads in the Senate. The Frustration Index today is a relatively mild 50 among Democrats, but a boiling 80 among Republicans -- and close to it, 72, among independents, the quintessential swing voters in national elections. Tellingly, the Frustration Index is a cool 19 among the few who say the economy's in excellent or good shape, rising to 65 among those who say it's not so good -- and 83 among the more than four in 10 who say the economy is in poor shape. In partisan terms, the index is relatively low (48) among liberal Democrats, but 81 among conservative Republicans; and likewise 48 among Obama supporters in a match-up with Romney, while 85 among Romney supporters. A vast 89 percent of Americans say the economy's in bad shape. It's ranged from 87 to 94 percent steadily since spring 2008. This gets old; people want relief. But 57 percent say that in terms of their own experience, the economy has not yet even begun to recover from the recession. And among the minority that says a recovery has begun, 81 percent say it's a weak one. The president's bin Laden bounce is gone. He had a 47 percent job approval rating in April. That bounced to 56 percent in a Post/Pew poll immediately after Osama bin Laden was killed. It's back, exactly, to 47 percent now. Forty-nine percent disapprove of the president's performance, including 53 percent of independents, and strong disapprovers outnumber strong approvers by 10 points. More -- 59 percent, a new high -- disapprove of Obama's handling of the economy, which, in a nutshell, is what the public's frustration is all about. Obama also is back to about an even split with the Republicans in Congress in trust to handle the economy -- 42 percent pick him, 45 percent the GOP. This also was essentially tied in December, then moved away from the GOP in January and March; we're now back to an even division on this most fundamental issue. On the deficit Obama fares worse -- 33 percent approval, down six points since April to a career low. In another expression of the public's discontent, just 34 percent say they're inclined to re-elect their representative in Congress. Fifty-five percent, instead, say they'll look around for someone new, a level of anti-incumbency as high as it was in early October 2010. If it holds, the risk may not be just to Obama, but to any and all officeholders associated with the status quo. In two equally critical measures, 66 percent say the country's seriously off on the wrong track and 69 percent describe themselves as dissatisfied or even angry with the way the federal government is working. Both are not quite as high as they were just before the last midterms -- but close. And 25 percent are downright angry about the way the government is operating, tying the high in polls since 1992. ROMNEY/PALIN -- Romney faces his own challenges. There's potential risk from the health care plan he signed into law as governor of Massachusetts in 2006: Leaned Republicans by 2-1, 41 percent to 21 percent, say they oppose that plan; and while a mere 3 percent support it strongly, 25 percent describe themselves as strong opponents. So far it's not hurting Romney significantly; even among those who oppose the law, 20 percent support him for the nomination, and in a match-up with Obama, 88 percent in this group take Romney. At the same time a substantial 37 percent of leaned Republicans haven't formed an opinion of the law yet; where they wind up may matter. Religion may be another question. Romney, a Mormon, has 15 percent support for the nomination from born-again and evangelical white Protestants, a core GOP group, vs. 23 percent from non-evangelicals. Evangelicals accounted for 44 percent of Republican primary voters in 2008, and Romney won 20 percent of their votes, vs. 28 percent from non-evangelicals. Palin, for her part, does slightly better with white evangelical Republicans than with non-evangelicals, 23 percent vs. 15 percent. But Romney edges Palin among conservative potential GOP voters, and runs evenly with her among supporters of the Tea Party political movement. Romney is strongest within his party among those earning more than $100,000 a year -- with 30 percent support vs. Palin's 9 percent -- and those with college degrees, 28-10 percent. Palin comes back among those less well-off, leading Romney by 25 percent to 11 percent among people with incomes less than $50,000. They're more closely matched in the middle-income group and among non-graduates. OBAMA/ROMNEY -- With Romney matched against Obama, most Republicans and conservative groups rally. Romney hauls in 87 percent of Republicans, 71 percent of conservatives and evangelical white Protestants alike, and two-thirds of "very conservative" Americans. No candidate does better against Obama among any of these groups. Romney gains 72 percent support from the 46 percent of Americans who describe themselves as supporters of the Tea Party political movement. But, showing breadth, he also draws in 48 percent of independents, the key swing voters. Romney currently fares better against Obama than John McCain did in 2008 among several important groups, and some surprising ones. Romney and Obama run evenly among women, a group Obama won by 13 points in 2008; among white women, while McCain won by 7 points, Romney leads by 18. McCain won white Catholics, an important swing-voting group, by 5 points, while Romney leads here by 19. Romney runs about evenly with Obama in the Midwest, a region Obama won by 10 points in 2008. While 18-29-year-olds still overwhelmingly favor Obama regardless of the Republican candidate, his margin against Romney is 23 points, vs. 34 points against McCain. Even among liberals, Obama's edge is down -- 79 points vs. McCain, 61 vs. Romney. CONSIDER? 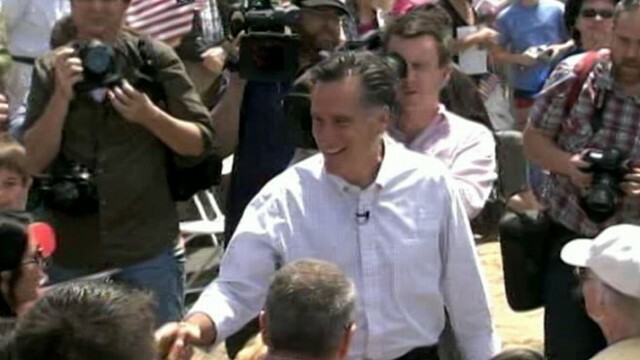 -- As suggested above, Romney's position far from shuts down other potential GOP runners. Majorities of leaned Republicans say they'd consider each of a dozen potential candidates tested, or at least haven't decided yet. Those garnering the most flat objections include Palin -- 38 percent say they definitely would not support her for the nomination; Ron Paul, 36 percent; and Newt Gingrich, 34 percent. Still, just 18 percent, by contrast, say there's no way they'd consider Romney. OBAMA'S BASE -- Obama, while down, is hardly out. Against Romney he retains support from 86 percent of Democrats and 79 percent of liberals, and majorities (regardless of his opposition) among non-whites, 18-to29-year-olds, moderates, East and West coast residents, college graduates, and people with incomes less than $50,000 a year. He gets more than two-thirds of the vote from those who are satisfied with the way the government is working and those who think the economy has begun to recover -- but these ranks are thin. Marking his teeter-totter position, Obama gets precisely split decisions, 49-49 percent, on two personal attributes, understanding the problems of "people like you" and sharing "your values." He does better, though, on one other -- 55 percent rate him a strong leader. But it's the economy that drives Obama's fortunes. Among the nearly six in 10 Americans who think economic recovery has not yet begun, 69 percent disapprove of the president's job performance overall and 64 percent say they won't even consider voting for him in 2012. Romney leads him in this group by 63-29 percent. Ultimately, 53 percent overall say they'd at least consider voting for Obama for re-election next year, vs. 45 percent who flatly rule him out (among registered voters, 47 percent). That leaves just enough room for Obama to gain re-election -- but with precious little margin for error. And if the economy worsens still, it'll be all the more opportunity for his ultimate challenger. Methodology -- This ABC News/Washington Post poll was conducted by telephone June 2-5, 2011, among a random national sample of 1,002 adults, including landline and cell-phone-only respondents. Results for the full sample have a 3.5-point error margin. Click here for a detailed description of sampling error. This survey was produced for ABC News by Langer Research Associates of New York, N.Y, with sampling, data collection and tabulation by TNS of Horsham, Pa.
+2012: Will Obama's Army of Volunteers Rise Again?